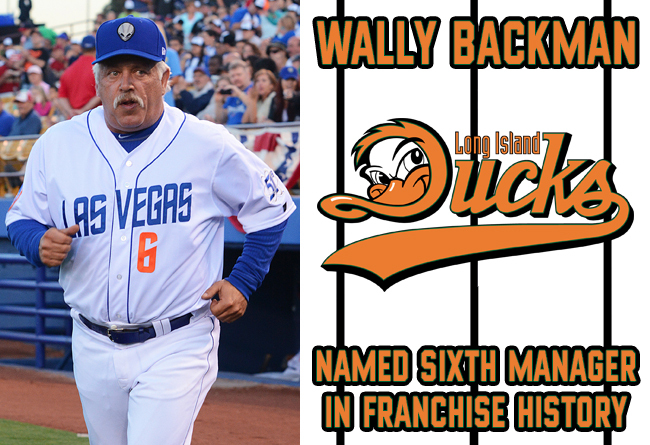 (Central Islip, N.Y., Nov. 28, 2018) – The Long Island Ducks today announced Wally Backman has been named the sixth manager in team history. Backman replaces Kevin Baez, who signed with the Rockland Boulders of the Can-Am League earlier this week. Backman is most well known in the New York Metropolitan area for a successful nine-year stint playing with the New York Mets, highlighted by winning the 1986 World Series. Following a 14-year MLB playing career, the former first round draft pick transitioned into coaching and now has 20 years of experience as a manager, winning six division championships and three league championships. He has compiled an overall managerial record of 1,127-1,077 (.511) and was named 2014 Pacific Coast League Manager of the Year for the Las Vegas 51’s, the Triple-A affiliate of the New York Mets. Backman spent the 2018 season managing the Ducks Liberty Division rival in the Atlantic League, the New Britain Bees, and saw five of his players signed by Major League organizations (four Triple-A, one Double-A assignment).